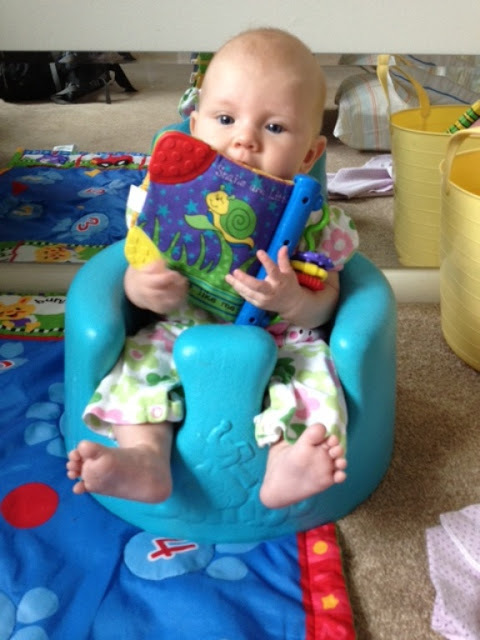 With all this literary interest in our home, I wanted to move our reading to the next step. But is Samuel (at almost 3) ready? Should we really start looking at easy-to-read books? How can I continue to use the Montessori method in the "learning to read" phase of our homeschooling? I love to start my research with a little background. The question "why" is sometimes hard to answer, but it just makes sense to me to understand a little about why and how may children learn language and writing. I also want to know why the Montessori method is the best choice for my family in teaching my children how to read and write. 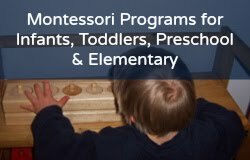 Montessori for Everyone is another very helpful resource. I found at there site that Maria Montessori observed writing is easier for a child to learn. Reading comes second. "When a child writes, all they need to do is turn sounds into letters. When a child reads, they need to pull apart the letters, turn them into phonetic sounds, and put them back together to make a word. It's a more complicated process." Makes sense to me! Montessori Primary Guide helped me understand how Maria Montessori saw language as part of a child's heritage. Children understand the thoughts of the society around them by using the language they are taught. As teachers we can start on a very basic level when teaching our children: sounds can be represented by symbols and by putting those symbols together can create words. Love the simplicity of this idea! After all my research I have learned that everything we have been doing with our sensory play will ultimately help Samuel with his writing. He has been working on coordination and finger strength through our play! What an amazing method Maria Montessori has created. For some helpful ideas on how sensory play can help your literacy journey please see Peaceful Parenting's post on literacy work. I plan on working on Samuel's writing skills first as suggested in much of the readings I have sited. Here are a couple helpful sites to reference on Montessori writing. The Wonder Years has a post on a good way to use the movable alphabet. Living Montessori Now is always a wealth of information. Here is a post on language activities. 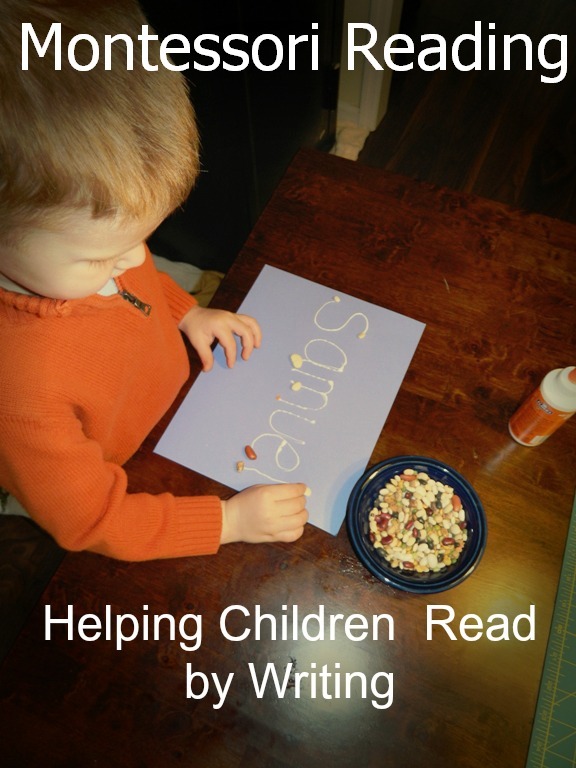 The Montessori Reading Program offers some very helpful information on beginning readers. There is an example of their books on this site. They suggest using their materials starting at age 2. I have plans on creating a set of alphabet boxes. I can see where this set of boxes will help both the kids in their language journey. There are many ways to use the alphabet boxes once we get it set up. Using the "I Spy" game or "Please Bring Me" game is a continuous theme in many materials I have read. Having your child find an object that sounds like the sound you are making. So our game would go, "Sam, can you bring me something that starts with the sssss sound?" And he would hopefully bring me a spider or a spoon. For the technologically savvy people out there, there are apps to help beginning Montessori readers. Montessori Home has The Montessori Reading Game app for the 5-7 year old and a Beginning Reader Book app for the 3-5 year old. I'm not quite sure how all the technology fits into the strict Montessori method, but I do know that Maria Montessori is quoted saying, "Education in a New World...education is a natural process carried out by the human individual, and is acquired not by listening to words, but by experiencing the environment." Technology is a huge part of our modern environment. Children see it in every aspect of their lives. In our home we use only smart phones, we use computers to create activities to help them learn, and use emails and online bill pay to do our daily chores. Why not use a Montessori app to help them read? I know that reading to my children is one of the greatest gifts I can give to them. The more words they hear the easier it will be for them to read later in life. Tons more information is out there to help you with your family's literacy journey, but hopefully this information will get you started in the right direction. Have fun and read a good book with the little ones today!